Paper Planes is a consulting firm specializing in Australian Immigration Law and Visa Services for Canada, USA and Australia. It was set up with one view in mind, to make migrating to Australia or Canada an easy, simple process and to demystify the legalities that go with the process of migrating. We understand what it takes to make such a life changing decision as moving countries. We take time and effort to understand each situation as each case is different and suggest options based on your personal scenario. Our fee options are also customised based on each situation. We have specialised in Australian Permanent Residence Visas (PR visas - Category 189/ 190), Australian student visas, Tourist/ Visitor Visas and Family/ Partner visas. For more details please refer the Australian Visas section on our website. We have now diversified into providing services for other countries as well and can very well provide Permanent Residence migration services to Canada as well under the Express Entry System. For more details on the services we provide for other countries please see below or refer the relevant links. Not only do we provide migration advice and assistance, but we also advise clients on the do's and don't s post landing from our own experience and in some cases through our on-shore partner we also provide our clients with onsite support. Our owner/ founder is a Certified Migration Agent qualified from Australia and has spent many years living and practising in Australia. We act in accordance with the Migration Agents' Code of Conduct and have an overriding duty to act at all times in the lawful interests of our clients. It was a really satisfying exerience. 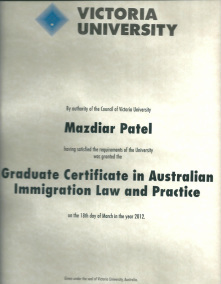 Mazdiar Patel, the consultant I was working with, is a real professional with high expertise in the subject. He explained every step of the process and detailed on the documentation required and how to procure them. I had asked him a hundred queries, which he patiently answered and provided alternative in case of issues with documentation. He made sure that the application was lodged with more than enough documentation so that there are no hiccups during the process. It was overall a great experience and I would highly recommend your service to anyone looking out to immigrate. You guys really know how to get the job done :) Thank you very much. "Service exceeded my expectation. Professional approach, transparent processes & resourceful staff. Mazdiar's guidance is resourceful & he is a patient gentleman." "Never felt we were dealing with a "consultant", Mr. Patel was more of a friendly guide through the entire process. The documentation is a labyrinthine process by itself, thanks to Mazdiar it was a breeze!!!!!!!! Thanks a heap!"